New Zealanders Neil Barnett and Russell Watts, who are both living with Multiple Sclerosis, will join the crew sailing the 67-foot sloop Oceans of Hope on the Darwin, Australia to Singapore leg of its round-the-world voyage to change popular perceptions regarding MS. Mssrs. Barnett and Watts were welcomed aboard the yacht on July 5 for their four-week sailing adventure, joining a crew of eight others, including five persons who have been diagnosed with MS. 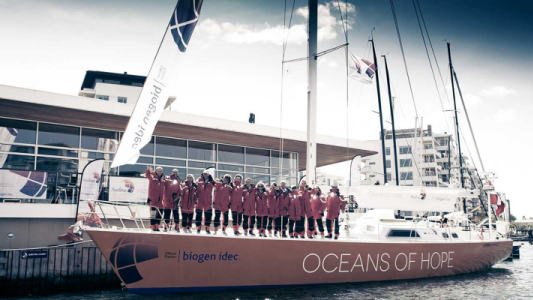 The Oceans of Hope project was pioneered by Dr. Mikkel Anthonisen, 48, Founder of the sponsoring Sailing Sclerosis Foundation (SSF) and a MS specialist at Copenhagen University Hospital, Rigshospitalet, in Denmark. Dr. Anthonisen has been a doctor for 14 years and from the ages of 19–23, took jobs on boats sailing all over the world. A doctor, psychotherapist and sailor, he realized the power of involvement in sailing after meeting a patient early in 2013 and began building the dream of sailing around the world with people living with the disease. The objective of Dr. Anthonisen and the other OoH crew members, several of whom are living with MS, is to build and strengthen bonds throughout the global MS and sailing communities on their circumnavigation of the globe, and to change perceptions of multiple sclerosis by showing what is possible when people with a chronic disease are empowered to conquer their individual challenges, engaging those whose lives are touched by MS, and developing networks as a foundation for life-changing behaviours. Oceans of Hope left Denmark in late 2014 on what is projected to be a 17 month journey, calling at multiple ports in Europe, North America, South America, Australia and New Zealand, South Asia, and Africa. Each port day is celebrated with an interactive event, giving local people living with MS the opportunity to learn to sail and participate as crew members. On the antipodean leg of the voyage — which marks roughly the halfway point of the 33,000 nautical mile circumnavigation — since early May, Oceans of Hope visited Auckland, New Zealand where it was officially welcomed in a ceremony held at The Royal New Zealand Yacht Squadron, and the crew took part in the celebration of MS Auckland’s 50th anniversary. Dr. Anthonisen was there along with OOH MS Crew from around the globe: Mara Johnson and Craig Ruding from the U.S., Henny Eriksen from Denmark, Peter Bosch from the Netherlands, and Arne Madsen from Denmark. Also taking part in the celebrations were Ex-America’s Cup sailor and NZ Paralympian sailor Richard Dodson, Neil Woodhams, President of MS Auckland, Malcolm Rickerby, President of MS New Zealand, Therese Russel, CEO of MS Auckland as well as members of MS Auckland and MS New Zealand. In Australia, Oceans of Hope arrived in Sydney for World MS Day on 27th May, including a sail-past of the landmark Sydney Opera House. Australians Andrew Potter and Greg Pugh had joined the Oceans of Hope crew before reaching Sydney, to remain on the yacht as Oceans of Hope sailed up Australia’s east coast, calling at Newcastle, Brisbane, and Cairns, all the way to the northern port of Darwin — the last stop before heading to Singapore. “It’s a privilege to join Oceans of Hope to help inspire others with MS and raise awareness of this devastating neurological condition. People with MS can still do great things and this world-first sail is testament to the progress that has been made in treating and managing MS,” adds Mr Potter. CEO of MS Australia, Debra Cerasa, said she was delighted that the arrival of Oceans of Hope in Sydney coincided with World MS Day. “We are especially delighted to have Andrew Potter on board Oceans of Hope as he is not only a wonderful person who has lived with MS for 25 years, and a keen sailor, but he also works as MS Australia’s National Advocacy Program Co-ordinator. The coinciding of World MS Day in 2015 and the arrival of Oceans of Hope into Sydney, with a crew that includes Aussies with MS and our very own Andrew Potter, has us all feeling very proud and excited,” Ms Cerasa observed. “It’s a great moment to be in Sydney for World MS Day and to have reached the half-way-point around the world on our circumnavigation. Oceans of Hope is about giving hope and providing possibilities to people living with MS. We want to create equal access to empowerment and to change the perception of what it is like to live with a chronic disabling disease. The MS crew can be very proud of their achievement,” commented Dr Anthonisen. Managing Director of Biogen in Australia and New Zealand, Joerg Hermans, said the company was delighted to be sponsoring such a groundbreaking project in MS. “Biogen is all about caring deeply and helping people with MS to change their lives. The Oceans of Hope project is certainly a global embodiment of those principles for us,” said Mr Hermans. “We are delighted to partner with Biogen Idec. Oceans of Hope aims to change perceptions of MS by showing what is possible when people with a chronic disease are empowered to conquer their individual challenges,” said Dr. Anthonisen. “As a physician, I see that each person who has MS is unique and needs access to different resources to treat their individual disease. Multiple Sclerosis (MS) is a chronic and currently incurable disease that affects the central nervous system, where scarring (sclerosis) on the myelin surrounding the nerves is damaged causing a range of symptoms including; mobility, speech and vision problems, cognitive changes and chronic pain. A diagnosis with this unpredictable condition frightening and unsettling, since the course an individual case of the disease will take is unknown. Oceans of Hope aims to broaden the horizons of those who perceive themselves as trapped by their condition, either physically or mentally, and inspire them to realize that they still have potential to achieve great things.